pressed five times, it selects the whole document. Select odd amounts: position the cursor where you wish to begin, press F8 and then use the cursors to extend the selection. To escape from selecting selecting mode, press the Esc key. The highlighter tool in Microsoft Word works as a Stabilo Boss highlighter might work on paper…it highlights stuff. You activate it by clicking the tool and then dragging over areas you wish to highlight in a document. To either view or hide the highlighting we need to go to the Options dialog box by clicking Office Button inV2007 or the File tab, Options for V2010. Uncheck the “Show highlighter marks” choice (and if it was off this would turn it on). This one option controls both the screen and printing simultaneously so don’t worry about which one is affected by your choice… the answer is both. Click OK. The highlighting is hidden but still exists. You repeat the steps to view it again. Barb recently came across the problem with a user who wanted to merge an Excel file with a Word document in order to do a mail merge. The problem they found was that if you merge direct from Excel, date and currency formatting that you have applied in Excel is completely ignored by Word, e.g. If you have formatted your date to show as 3 Oct 2011 in Excel, Word converts it show as 10/3/11. The only way to keep your formatting is to copy the data into a Word document and when pasted your date and currency formatting is retained but as they notes are quite comprehensive, we offer them here as a pdf download: Merging Excel with Word. Go into Print Preview (Windows button, Print, Print Preview), otherwise click the Print preview button if you have installed it on your Quick Access toolbar. Click the check box next to the Magnifer button. The I beam now becomes visible, the same as you would see in Normal view. 5. Toggle between editing and viewing by clicking the Magnifier check box. Barbara Stapleton who works with me contributes to the Tech Republic’s IT forums on a regular basis (as stapleb). 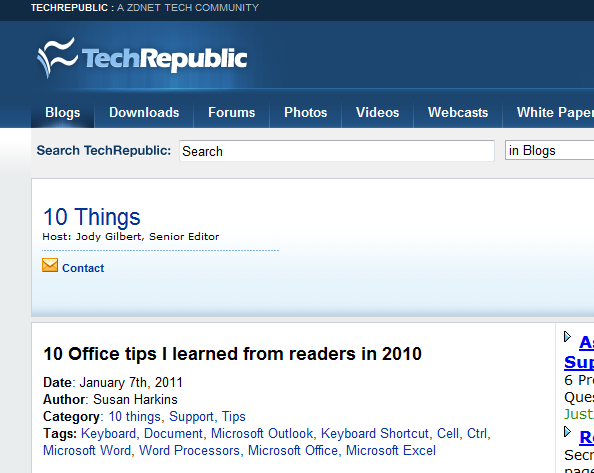 Her advice on adding watermarks to Word documents was added to the list of their recent post, 10 Office Tips I learned in 2010. Read the Tip here. Congrats Barb! This often stumps people: you’ve created a table in MS Word and you want to use tabs within table cells – but there’s a problem – each time you press the Tab key you jump to the next cell – even after setting tab stops in the cell. How do you get around this? I mean what’s the use of tab stops if you can’t get to them? The secret is the Ctrl key. To get to a tab stop within a cell, use Ctrl + Tab. That does the trick!